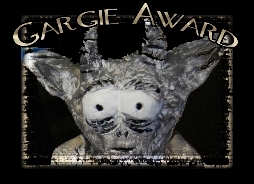 Not even the ravages of your own mind. So I continue to let my dreams grow daily. And peek at all that I am currently manifesting. It is only just beginning!! And one day, with whitened hair, desires failing, strength ebbing out of me, with the sun going down and with only the serenity and the calm warning of the evening star left to me, I will drink to Life, to all it has been, to what it was and to what it will still be. Hurrah! Make sure you make it count. ~ Here is to relentlessly pursing what you truly desire no matter where in life you are. Happy ChooseDay everyone! Could It Be Written in the Stars? Soccer (or football) as it is known in some countries is not high on my list to watch, in fact it is never on my list to watch. The UEFA Champions League and English Premier League and whatever other leagues they have, it’s all just completely unexciting for me watching a bunch of drama queens running around the field. No offense, but it’s true! 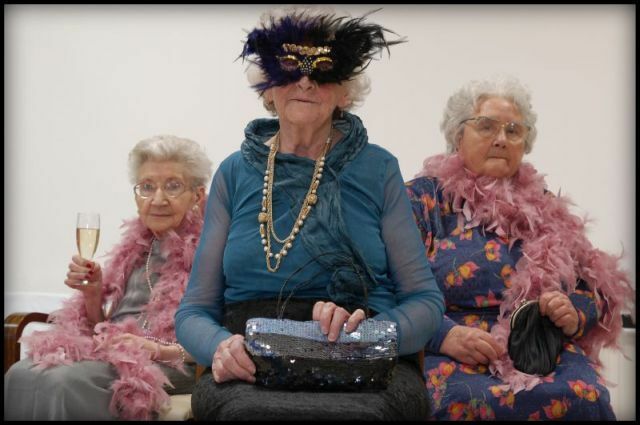 BUT once every four years something very different happens, something special. Soccer teams playing for their country come together for the Soccer World Cup. It’s special for me because it brings back memories of years gone by, some really special memories. Back in 1990, I was just a 15-year-old girl in Grade 10. That year it also just happened to be the Soccer World Cup. It was held in Italy that year and one night just as I was getting ready for bed a game started broadcasting on the TV. I sat there, drawn to the game playing out in front of me. My mom watched for a while with us and then headed off to get ready for bed, leaving me and my dad to watch alone. During the Soccer World Cup in 1990, it was quality father and daughter time. From that night onwards, every night my dad and I would watch the games together, going well past my bed time as it was on many a school night but I had being drawn in. Then I watched West Germany play. I was hooked and from that moment onwards, they become my team and I, their biggest fan. There was no doubt about it too, as a 15-year-old girl, Jurgen Klinsmann and Thomas Hassler, of course, helped seal the deal! After watching my team play live at the Cape Town Stadium, the celebrating spilled out onto the streets. 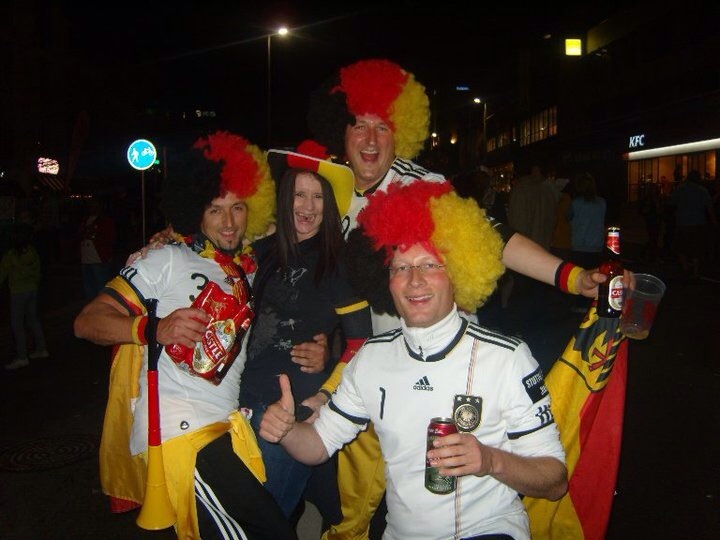 Here I am celebrating Germany’s win with some random Germany fans in 2010. My dad and I went on that year to watch West Germany score a goal against Argentina that saw them winning the world cup that year. Since then it has been a love affair every four years when Soccer World Cup comes around and Germany walks onto the field. To this day, I still have every single newspaper clipping from 1990 about my team, from the start of the games to their ultimate win at the end. 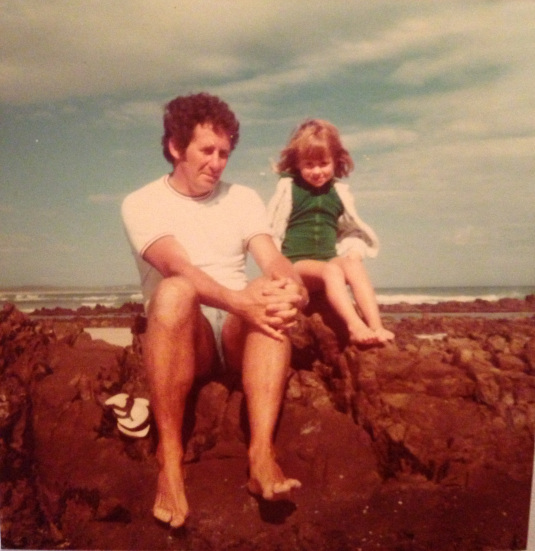 That year, watching those games with my dad, are some of the fondest memories I have. Little did I know in 1990 as I watched my West German boys lift the cup that exactly 20 years later I would realise a big dream. Fast forward to 2010 in South Africa, the hosts of Soccer World Cup! Our country came alive with foreigners, soccer, and true South African gees (spirit). 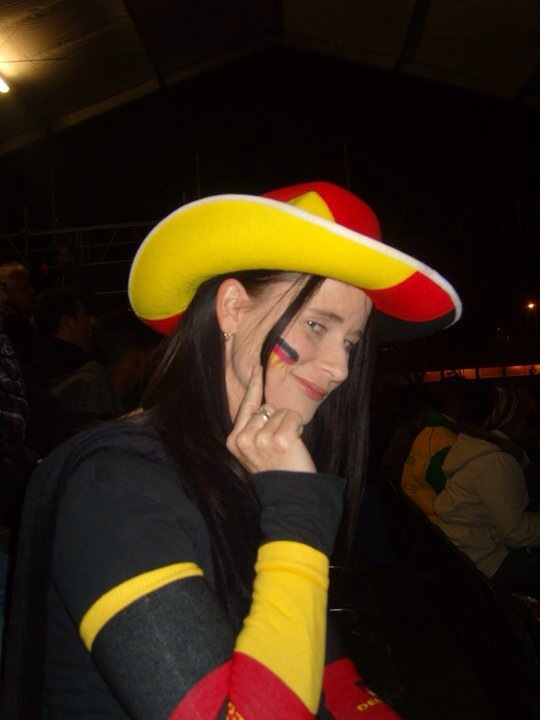 That year I supported two teams, my country’s team and of course, Germany. 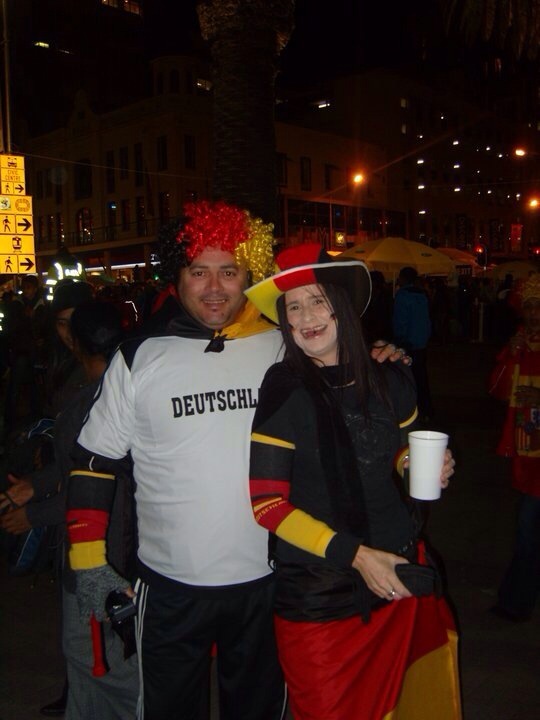 Germany was doing well, moving their way through to the quarter finals, which was to be played in Cape Town!! There was only one thing for me to do. I had to get my hands on a ticket so that I could watch the team I loved so dearly. But there was a big problem. The game was completely sold out!! I tried everything, I searched everywhere, I phoned everyone I knew who might just be able to find me a ticket. Again and again I came up empty-handed. My heart grew heavy with every “no, sorry I just can’t get anything for you.” I begged, I pleaded, I told everyone who would listen to my story. Then news came from a friend that she might know someone up-country who was selling their ticket as they couldn’t attend the game. My heart started beating a little faster. Could it be?! Messages back and forward, money ready to be paid. Time ticked by so slowly. Then the news came. The ticket was mine if I want it. That day, fate handed me a ticket. I could hardly believe it was true. I paid the money for the ticket and arrangements were made to ship the ticket down to Cape Town. These were the most agonising days. Finally, news came that my friend had my ticket. In her hand. I was beside myself excited. I told her to guard that ticket with her life and asked numerous times if it was real. This ticket was worth gold to me. 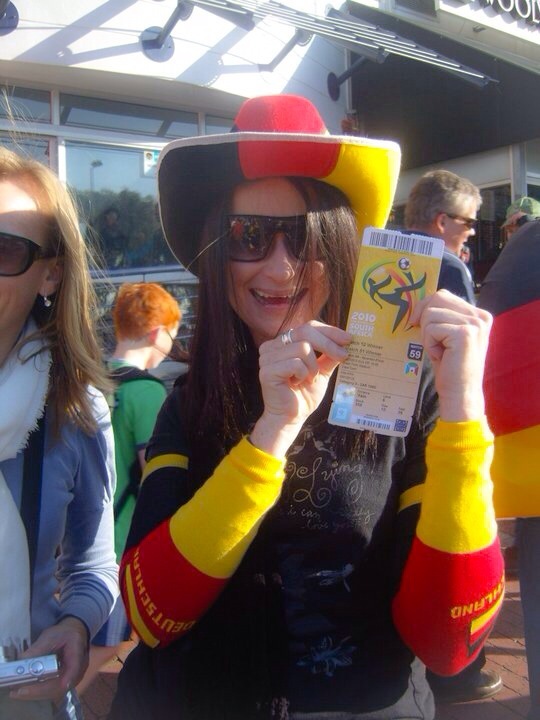 An absolute dream come true, I was going to watch Germany play Argentina in the Soccer World Cup 2010. 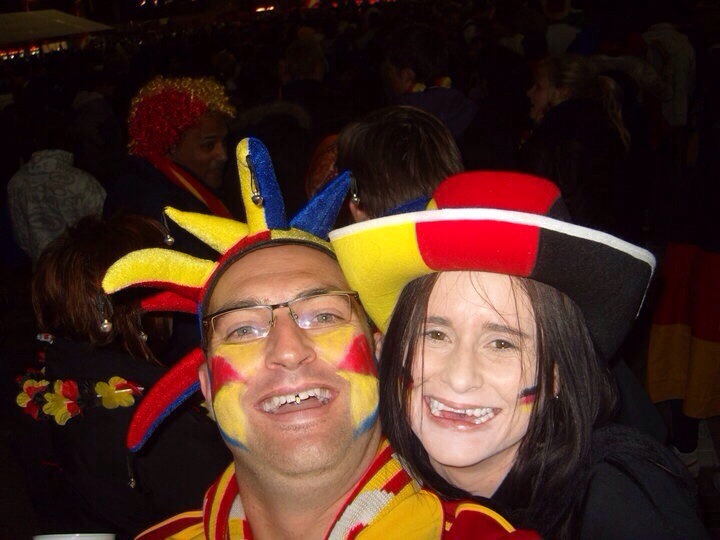 On the 3rd July 2010, draped in Germany’s black, red and gold colours, with my friend at my side, we walked into the stadium. The vuvuzela’s were going mad, the stadium was packed, the atmosphere making the hairs on your arm stand to attention. Germany played Argentina that day, and it was so fitting to watch this game live as it was the same team they played in the final back in 1990 that I watched with my dad. A game that lead them to lift the world cup in victory. Back in the stadium the game started, I was on my feet, screaming for my team and generally going mad. There was no doubt in anyone’s mind who I was supporting. Germany went on to win the game 4 – 0. I was over the moon ecstatic. After the game, as we filed out the stadium, the streets came alive with revelers celebrating Germany’s victory and Argentinian fans drowning their sorrows. We partied in the streets and in the square that night, other German fans stopping me along the way, sharing photos and hugs with complete strangers. It was an absolute dream come true and I had come full circle! Getting ready to watch the game! Celebrating with another random Germany fan. 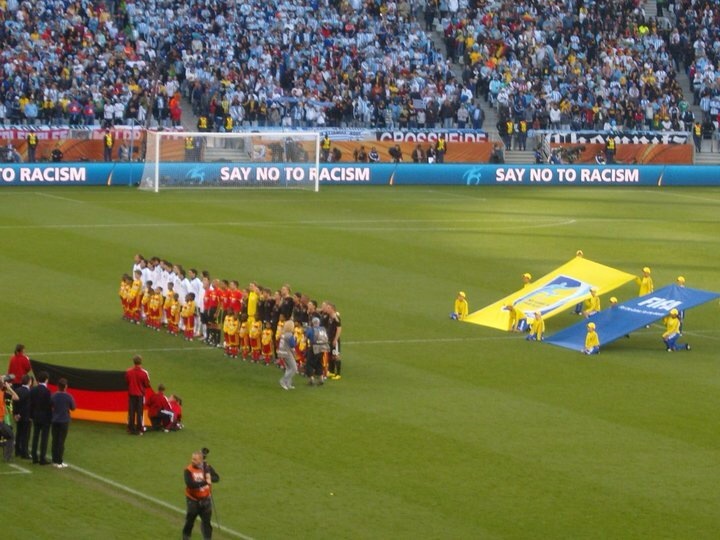 Germany and Argentina on the field ready to sing their national anthems. It was so surreal being there! I had come full circle! A sea of Germany fans inside the Cape Town Stadium where I got to watch Germany play. 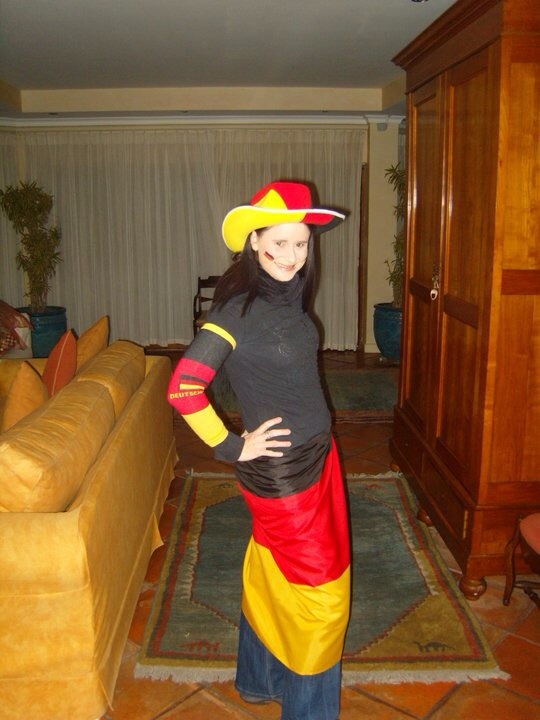 Now, since 1990, every four years I bring out my Germany colours ready to support my team once again. Excitement bubbles up inside of me as I watch my team step out onto the field, my eyes glued to the screen as they begin to play. For the entire month of the Soccer World Cup in 2010 I floated through time in a happy glow of all that was soccer! Our country came alive with oneness, celebration and the friendly rivalry was the best. My dear friend and I watched games together, especially when our teams were playing. The only problem was he supported Spain and I, of course, Germany! It was a wonderful month that found the two of us in the thick of the celebrations. We even got ourselves put on camera as two crazy Australian guys interviewed us for fans “back home.” Then the inevitable happened, our teams were due to play each other in the semi-finals. Someone was going to lose, I could only hope it wouldn’t be my team. 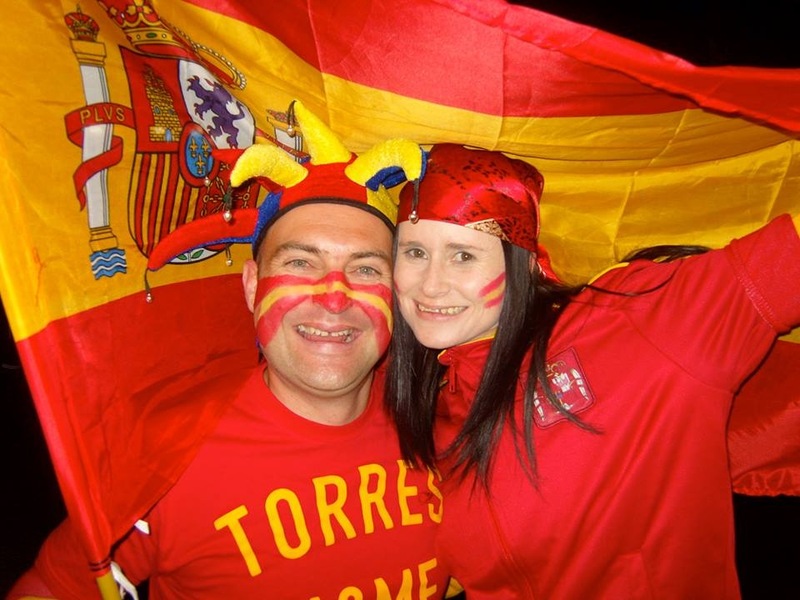 Sadly, with a broken heart, Spain stomped all over Germany and that night as Spain revellers celebrated in the streets, I kept a brave face on as I walked through the throng of Spain supports in my Germany colours. I was crushed! Little did I know what would happen next and don’t tell anyone this, but my friend actually managed to persuade me to deck myself in Spain’s colours and go with him to the final to support his team, and as I’m a good sport, I did! If I couldn’t support my team in the final because they were no longer there, I could at least support a friend! Spain went on to win the world cup that year. We had the best times at the games, watching wherever we could! Friendly rivalry between my friend and I. He supported Spain and I, Germany! 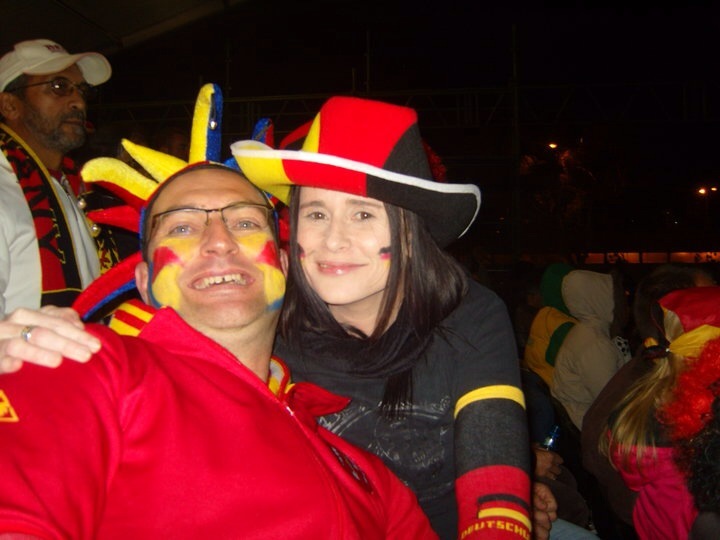 I was heartbroken my team crashed out of the SWC 2010 in the semi-finals against Spain but I was a good friend and for the final I dressed in the colours of Spain and supported my friend supporting his team. I know one day he will return the favour! As the world cup starts tonight, I along with millions of others, will be watching the games and more specifically Germany’s journey through each of the stages. The Soccer World Cup holds incredibly special memories for me, right through from 1990 through to 2010 and as we are about to embark on 2014 World Cup, I can’t wait to add more memories to my SWC pile. 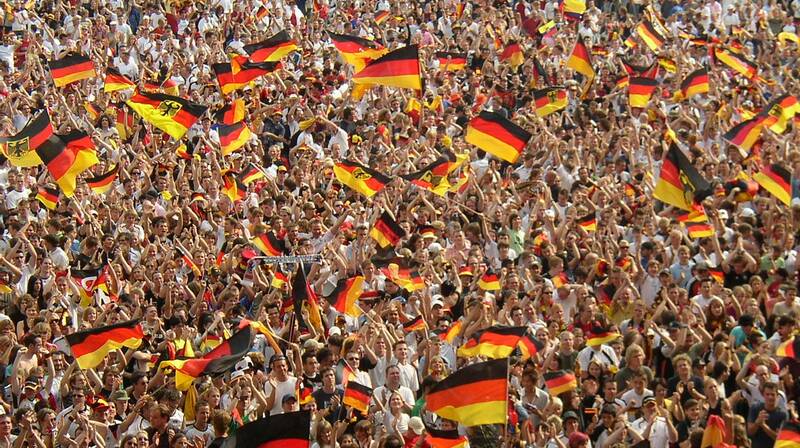 Germany’s world cup wins were in 1954, 1974 and 1990. It is now 2014, do you see what I see? A year with a 4 in it, which has previously been lucky for Germany! Could this be written in the stars? I think it’s time boys, for you to lift the cup again. Your # 1 fan is behind you all the way.